I admit it. I’m an animation geek. And I’m particularly geeky when it comes to Walt Disney feature-length animated films that were produced when Walt Disney was alive. So you can understand why I was shocked to hear that some young people today think “Walt Disney” is a made up brand name. Like Captain Crunch, or something. Diane Disney Miller, the daughter of Walt and Lillian Disney, was shocked too. So much so, she and her family went to an enormous effort (and a heck of a lot of expense) to preserve the history and imagination of her father’s legacy by founding The Walt Disney Family Museum. The moment you step inside the first interactive gallery, you are walking in Walt’s footsteps, with his voice narrating his story. The journey starts with Walt’s ancestors immigrating to America, and shows you their humble beginnings on a farm in Missouri. From there you join Walt’s adventures selling papers, working on a train, enlisting in the army as an ambulance driver, cartooning, and creating his first animated films. Not all of his early endeavors paid off. After a bankruptcy and losing the rights to his first animated character, Oswald the Lucky Rabbit, Walt was on a train when he got the idea for Mickey Mouse. When you step into the elevator to go up the second floor of the museum, you step onto that train car with Walt, as he tells you the story. When you get off the car, you’re in Hollywood! As you walk through the galleries, you witness the development of a new animated art form, and the plethora of products and technologies that followed. The men who worked with Walt share their stories at the touch of a finger, on interactive consoles throughout the galleries. It’s amazing that one man could assemble such talented teams — artists and engineers — and inspire their genius to create all that they did. I could ramble on and on about the live-action films, nature documentaries, audio animatronics, and other technologies Walt Disney inspired. And don’t even get me started on Disneyland. But that would be boring. It’s much more fun if you sneak a peek at the Interactive Galleries on the Walt Disney Family Museum website! And while you’re over there, check out the Special Exhibitions, Classes and Workshops, and Special Programs for the whole family. I just walked through Walt Disney’s life, and it was so cool! That simple statement — made by someone who wasn’t alive during Walt Disney’s lifetime — proves the timelessness of Disney magic. Forty-seven years after his death, Walt is still creating magic … for young and old alike. In the following video Diane Disney Miller announces the museum’s opening on October 1, 2009. 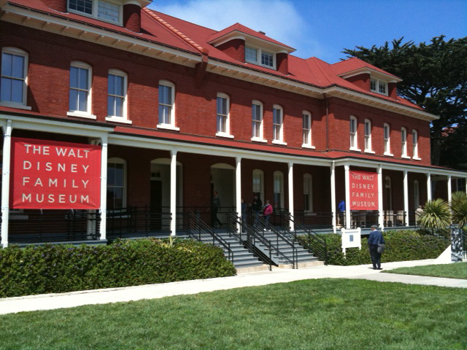 If you’re planning on visiting the museum, be sure to check the Walt Disney Family Museum web site for Hours, Location, and Directions. There’s ample parking directly across from the museum too! New Year’s Day, Thanksgiving, and Christmas Day. I visited this museum a few years ago and loved it. I’m into anything Disney, but especially Walt. I loved that he had such and imagination and got things done. Hi Melissa, The museum’s exhibits change on a regular basis, and they’ve started showing *special limited engagement exhibits* too. I’ve been to several of the talks, which were wonderful too. I love going to this place as well. It’s not really a kids museum…so my kiddos get a little bored. But it is a fantastically well done place. I keep wanting to become a member, but it’s an hour away by car (close…yes…but not quite close enough). Either way…whenever I am in the city…I try to make it a point to drop by. Great gift shop too…by the way. I agree that this museum is geared toward a teenage to adult audience. To their credit, over the last year they have been doing more “open studio” type activities (that take place in rooms on the lower level of the museum) to engage a younger audience. I live down on the peninsula, a 45 minute drive from the museum (without traffic), so I don’t get up there as often as I’d like. But every time I go, I’m amazed. They do a terrific job keeping it fresh, with new exhibits, talks, and films. Sounds like a seriously cool museum! One of the things I do involves museum work, here in NZ & the translation of content into a presentation for viewers – including pitching it etc – is a fascinating field. Apropos Disney, years ago, I did an undergrad social anthropology course that studied Disney’s creations as an anthropologist writes ethnography. Led to some curious insights, e.g. Disney’s descent patterns were usually non-linear – every family relationship was ‘aunt’, ‘uncle’, ‘niece’, ‘nephew’ and so on. Curious. Like father, like daughter. Diane Disney Miller only settled for the best when it came to design. The amount of information displayed is mind boggling, yet it is ALL visually appealing. If content presentation is one of your areas of specialty, you must have heard of Tufte. I worked under a UI designer who studied his work extensively. When you and your wife come to visit the WDFM, I would be honored to treat you as my guests. I mean that sincerely!